Lumariver makes specialized software tools for the quality conscious photographer. We are a small group of software development specialists that also have a passionate interest in photography. In Lumariver we combine this and make software that solves challenges we encounter ourself in our own photography. We can truthfully say that our software is made for enthusiasts, by enthusiasts. Lumariver is located in Sweden and owned by Xarepo AB. Contrary to popular belief, the camera profile rather than the camera sensor is the key factor in how colors appear in our digital photographs. However, due to legacy thinking rooted in the analog days, camera manufacturers and raw converter makers still feed us with "canned looks". As a result colors are unpredictable, tuned to someone else's taste, so when you move between camera models or raw converters your color expression is forced to change with it. We think that there is a better solution: break free from the canned looks and take control over your own color expression by making your own camera profiles. You get a good stable baseline for your own post-processing, regardless of camera brand or model, regardless of which raw converter you choose to use. 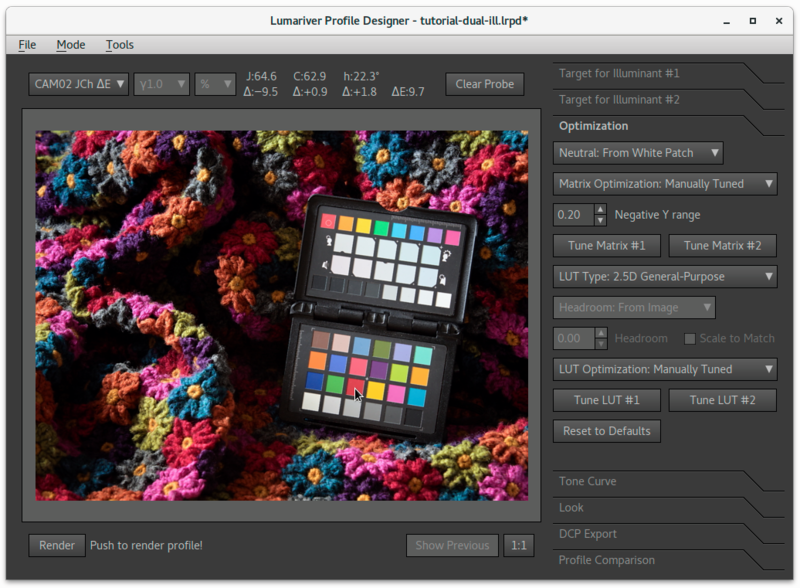 Lumariver Profile Designer is a software that makes profiles for your camera (or scanner), either in DNG Camera Profile (DCP) or ICC format, thus supporting almost all raw converters on the market. Like any profile maker it can be used for reproduction (copying artwork and similar), but it's also specifically designed to make great general-purpose profiles which provide both accurate and attractive colors. Profiles ideal for any subject — portrait, product, documentary, wildlife, landscape, architecture, etc — and serves as a sane realistic baseline for your creative post-processing. While being the most advanced profile design software on the market it has well-tuned default settings which makes it easy for the casual user to make a profile in only a few button presses. It's well documented including simple step-by-step guides for the casual user, and advanced tutorials for users that want to drill deeper into the finer details of profile making — a task that is both science and art. Lumariver Profile Designer takes the art aspect seriously and provides the tools needed to actively design your profile. The software is available for Microsoft Windows (64 bit) and Apple MacOS. See the feature list in the user manual, have a look at the introduction video below and download to try it out. Lumariver HDR does merging of multiple exposures into one noise-free high dynamic range file and tonemapping of such files or single images. 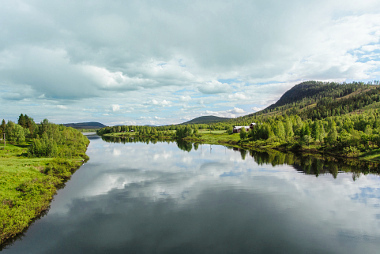 Gallery quality: merging images with no visible seams or ghosting, and halo-free tone-mapping. Full visibility of what the software has done to ease critical inspection. All processing available as layers, allows manual override and tuning for cases that requires artistic decisions. Flexible import and export to allow many different workflows involving other imaging software. 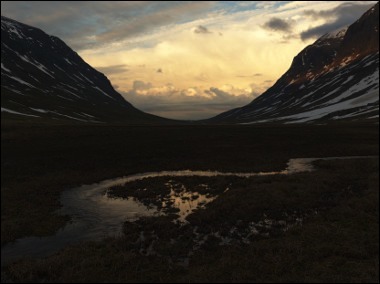 Photographer in control: results from algorithms easy to understand and fine-tune. Supports raw-in-raw-out workflow for best integration with popular raw converters. Flatfield correction / lens cast calibration (LCC) to support digital medium format technical photography. 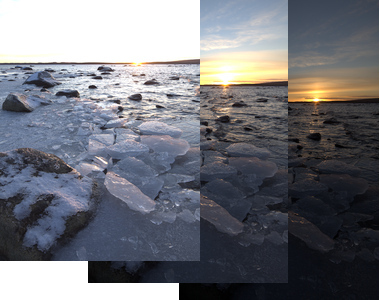 The Lumariver HDR merging algorithm primarily employs stitching instead of blending. The seams are narrow and put in as inconspicuous places as possible. One advantage of this approach is that ghosting is avoided, i e no blurry figures from blending together images where something has moved. 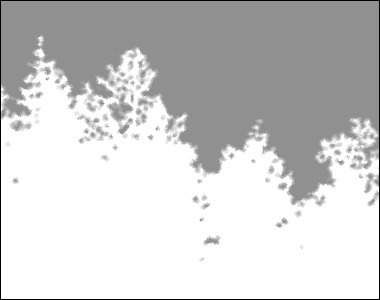 The algorithm tries to form large contiguous areas, while avoiding poorly exposed or clipped pixels. Having large areas makes the result easier to manually edit if one would want to. 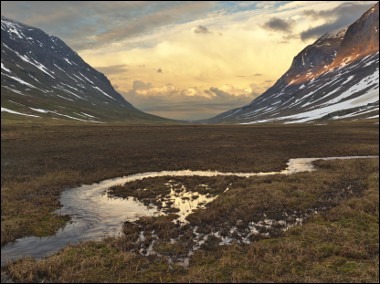 In addition to this main merging algorithm Lumariver HDR also have a always-use-best-exposed-pixel merging algorithm suitable for repro photography when zero movement and stable light can be guaranteed. If you wish, merging can be made from raw files and then be saved to a raw output file (DNG), so it can be treated in your favourite raw converter as if it was a single exposure, only with noise-free shadows. 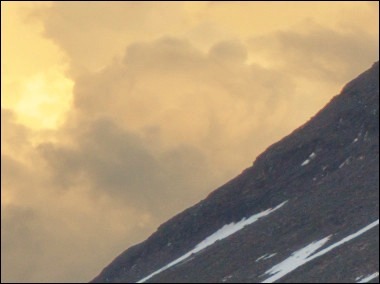 In some situations the dynamic range of the scene is so large that the camera cannot capture it without either clipping highlights or getting very noisy shadows. The noise comes both from camera electronics but also the lack of light, the photon shot noise. The solution is to shoot the same scene with different shutter speeds in quick succession, to capture well-exposed shadows and unclipped highlights. The exposures here are 1/13, 1/50 and 1/200 (3 exposures, 2 stops between each). This scene is a tough one since we have moving water in it. Rather than just picking "the best exposed pixels" Lumariver HDR's top priority is to avoid ghosting and visible seams. 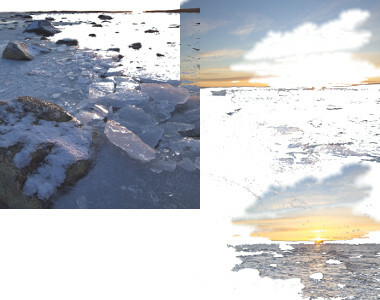 In this case the sun and highlights are taken from the darkest exposure, including the moving water as it's connected to highlights, large parts of the sky from the middle exposure and the darkest shadows from the brightest exposure. Note that the seams are made wider in low contrast areas to avoid visibility (due to slight differences in noise levels between images etc). 100% crop of detail showing the seams and the resulting image, and a small crop showing the noise level if only the darkest exposure would be used; ugly chroma noise would then become apparent. 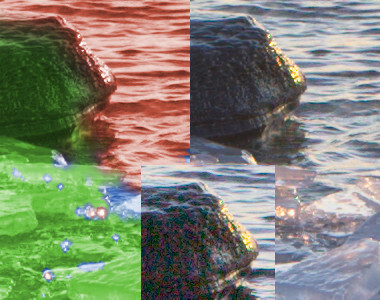 In this crop the darkest exposure has been used for the small specular highlights and the moving water (marked in red). Finished tonemapped image. The merged image can for example be exported to a multi-layered 16 bit tiff for further treatment in your favourite image editor, with or without tonemapping applied. It is also possible to inspect the merge masks directly in the software. We think this is important since an automated algorithm can never guarantee absolute perfection in all cases this is needed, but also for the photographer's artistic integrity. Lumariver HDR does not employ any black magic merging techniques, just layer masks and gives the user full access to them. Dramatically put, the tonemapper of Lumariver HDR is designed for those who don't like HDR. It's all about natural-looking results, and nothing about that grunge HDR look we all know from the web. If the casual gallery viewer doesn't think any processing was used at all and the expert thinks it's the result of a well-balanced all-manual work, then Lumariver HDR has done what it should. Most HDR tone compressors make a hefty local contrast increase to fit the tonal range, which gives a very specific HDR look. The Lumariver HDR tonemapper avoids this and instead uses methods similar to traditional dodge-and-burn to shift large contiguous areas in relation to each-other. This gives a more natural result, which also can be recreated in any photoshop-like software (with enough time and patience). We have not tried to make a unique look, but exactly the opposite. For fine art images we think it is important that post-processing software is neutral in terms of look, as it helps in making the prints timeless. We like to see the tonemapper output as an automated dodge-and-burn which can be used as is or as a starting point for further manual work. This scene is backlit from the sky. For the naked eye which has a huge dynamic range there is no problem to see all details and colors in the sky, mountains and ground. For the camera it's different. To not blow the highlights in the sky the image out of the camera has a very dark foreground. The same image processed with Lumariver HDR tonemapper, which yields an image both truer to the eye and better as a print. 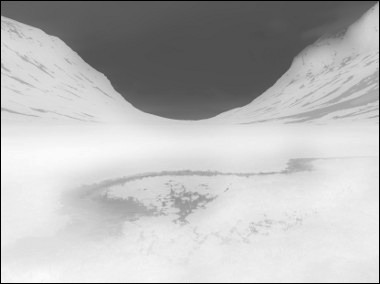 Note that all details and contrast in the sky is kept, while the foreground is considerable brighter. There is no haloing, the result is natural and photographic, far from the "grunge HDR" look which has made HDR (in)famous. This is the tonemap Lumariver HDR generated for the image, which can be extracted edited and reapplied if you would want to make any detail adjustments. Note the sharp edge which has been detected between sky and ground. The hard edge algorithm is a "secret" of the tonemapper, this is what makes it good at retaining natural contrast of different features while fitting them together in the narrow dynamic range available on a screen or print. Being able to see exactly what the software has done and edit it if needed is a central feature, Lumariver HDR lets the photographer be in total control. A 100% crop of the edge of the tonemapped image (unsharpened). No visible artifacts even at close inspection is a key goal of Lumariver HDR. Hard edge transitions is not always the best solution though, if the edge is not sharp enough or the difference in brightness too small a softer transition works better. Lumariver HDR auto-detects these and makes soft transition zones in those areas. 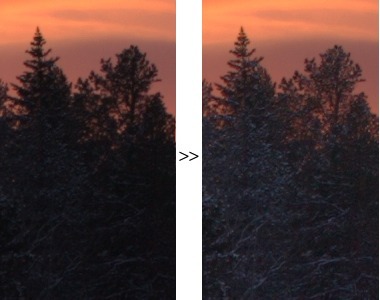 This is a before/after 100% crop of an other image showing the tonemapper's ability to avoid halos around complex edges even when compression is high. The sky has here been lowered 1.5 stops. Note that the local contrast and saturation of both the sky and the forest has been untouched. The multiply blend mask of the same crop generated by the tonemapper, which is available to the user for inspection and/or further use in an image editor. Computer algorithms can never be 100% perfect, so if you are working on an important image and you are a perfectionist, you will want to make some manual adjustments in an image editor. Lumariver HDR is designed to allow this. 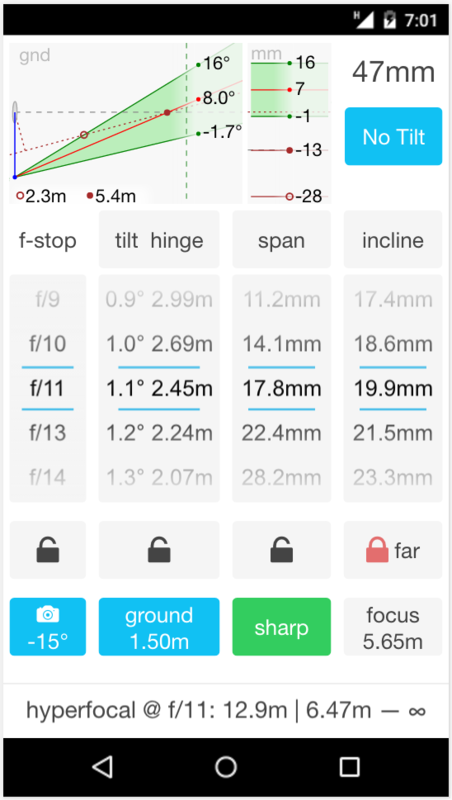 The Lumariver Depth of Field Calculator (Luma­river DoF) is an app for your mobile device that helps you maxi­mize the sharp­ness of your photo­graphs. 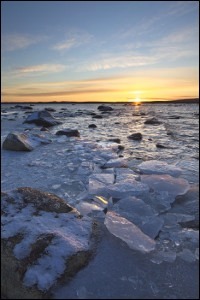 It's pri­marily intended for landscape, architecture and similar photography genres where the goal is to have a sharp image front to back. It's designed for being a practical tool in the field, and it has a thorough user manual that describes how it's used in real use cases. There are lots of Depth of Field apps out there, but none that fulfilled our own requirements for our own photography needs — to actually be used smoothly and effectively in the field when shooting, both using normal and tilt-shift lenses. That's why we made this app. It's available for Android and iOS and the user interface is optimized for one-hand operation on mobile phones, but it also works on tablets. Animated diagrams to visualize the depth of field. Supports both plain depth of field and tilt (tilt-shift lenses, Scheimpflug principle). Choose overlap, range, change aperture during stack etc. Note: intended for full-size scenes, not macro photography. Clean configurable user interface, you can turn off functions you don't intend to use. Tested workflows for real use in the field, the calculator shows the information you really need. Custom circle of confusion sizes, including relative to airy disc diameter and/or pixel pitch. Supports dual circle of confusion sizes, one "sharp" and one "soft" to make it easy to do controlled trade-offs in difficult situations. Enter your camera(s) and lenses once and have them easily accessible by name. Cameras configurable with sensor size, pixel pitch (optional) and live view size (optional). Lenses configurable with focal length (fixed or zoom-range), min/max aperture, aperture stepping (1/3, 1/2 or full stop) and near limit (optional). Supports both small and large digital and film formats, and custom sizes. A database with various cameras and lenses is bundled for quick and convenient configuration, but shouldn't your camera exist in the database you can always enter it manually. Distances in meters or decimal feet. Customizable distance scale to work well with various rangefinders. 4 inch or larger screens recommended. Smaller screens possible but may require vertical scrolling to reach all buttons. Below is a short video than quickly runs through the main aspects of the user interface. Note that the configuration screens are not shown in the video. Here you can download Lumariver Profile Designer. The downloaded software is fully functional except for saving projects and exporting profiles. To be able to save your work you need to purchase a license below. Requirements: MacOS 10.11 or later, 4 gigabyte RAM or more. Requirements: Windows 7 or later (64 bit), 4 gigabyte RAM or more. Note about Windows Smartscreen (the "Windows Protected your PC" message): for your safety all our software is digitally signed (by Xarepo AB, the company that owns Lumariver). This way you know that the software comes from us and no others. However, as we are a new publisher in the Windows market Smartscreen will (probably) still warn and show a "Windows Protected your PC" message when you run it. This is normal, as it warns for all new publishers with new software, or just niche software like ours where installs aren't counted in millions. To continue, just see that the publisher is Xarepo (press "More info" if required) which guarantess that the software is digitally signed by us, and press "Run anyway" to install. You may install the software on as many computers as you want as long as it's you that uses the software. The license will of course be valid for bug fixes and minor version upgrades. Here is the End User License Agreement: EULA. It's a standard one with the usual disclaimers. We handle purchases through 2checkout. When you make a purchase you will get an email with the license key sent to you (it's automatic so it's processed immediately, but please have patience for some email delivery delays). Then you copy-and-paste your email address and license key into the software and you can start working right away. The license key comes as a text file attachment, it can be hard to see in some email clients, so look carefully. The software is segmented into three different editions with increasing amount of functionality. See the user manual for a detailed description on exactly what differs (you may also test the different editions when running in trial mode). Casual users using Adobe's raw conversion products will most likely choose the Basic edition, users that need ICC support and/or more support for custom design and custom target reference will choose the Pro edition, and users that want the unlimited edition which includes reproduction features such as a 3D LUT for color correction, custom and free-form targets and multi-target will get the Repro edition. Purchase Lumariver Profile Designer Basic Edition license €30 note: only makes DNG profiles! Contact us if you need an upgrade, volume license, or if you have any licensing questions. Link to our email is found in the footer of this page. Here you can download Lumariver HDR. The downloaded software is fully functional but will watermark the output. To get rid of the watermark you need to purchase a license key which you enter into the software after installation. Requirements: MacOS 10.7 or later, 4 gigabyte RAM or more. You may install the software on as many computers as you want as long as it's you that uses the software. The license will of course be valid for bug fixes and minor version upgrades. Here's the End User License Agreement: EULA. It's a standard one with the usual disclaimers. We handle purchases through Avangate. When you make a purchase you will get an email with the license key sent to you (it's automatic so it's processed immediately, but please have patience for some email delivery delays). Then you enter your email address together with the key into the software and you can start using it right away. 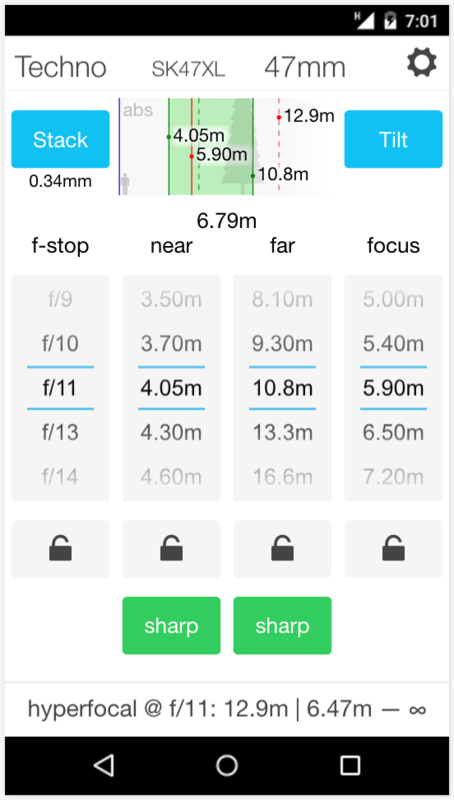 The Lumariver Depth of Field calculator app is distributed via Google Play for Android, and Apple's App Store for iOS. Click the links or start the store app and search for "lumariver" and you will find it.